Book Review Passport. By Alexander Chekmenev Reviewed by Forrest Soper After the fall of the Soviet Union, there was an effort to fully integrate the former Soviet citizens into the newly independent Ukrainian government. One of the ways the government accomplished this, was to require its citizens to replace their former Soviet passports with new Ukrainian issued documents. Passport. By Alexander Chekmenev. Dewi Lewis Publishing, 2017. Dewi Lewis Publishing, Stockport, England, 2017. In English. 156 pp., 74 color illustrations, 9¼x12x¾". After the fall of the Soviet Union, there was an effort to fully integrate the former Soviet citizens into the newly independent Ukrainian government. One of the ways the government accomplished this, was to require its citizens to replace their former Soviet passports with new Ukrainian issued documents. While many citizens were willing and able to renew their passport, a number of individuals were not. As a result, the Ukrainian government hired photographers to accompany social workers, to take passport photographs of the individuals who were unable to have them taken themselves. This included the elderly, the ill, and the physically and mentally disabled. Alexander Chekmenev was one such photographer, and between 1994 and 1995, he worked alongside social workers to photograph the inhabitants of the town of Luhansk. Chekmenev photographed hundreds of individuals during this brief period of time. A selection of this work is beautifully presented in Passport, a new publication from Dewi Lewis. After a photograph of the artist’s own passport and a brief introduction, the book begins with a series of headshots. These photographs are of various sizes and printed on semi-translucent paper. 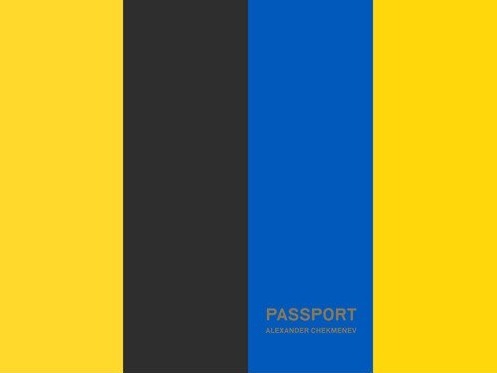 Surrounding the headshots are the black outlines of rectangles, which serve to show what the size of the passport would have been in relation to the photograph. While this section of the book acts as a curious introduction, it is nowhere near as powerful as the images that follow shortly after. The remainder of the book contains some of the most intriguing, powerful, unique, and unsettling environmental portraits that I have ever seen. To create passport photographs, it was essential that Chekmenev photographed these individuals in front of a blank backdrop. In order to meet these requirements, social workers would hold a blank cloth behind the subject to isolate them from their surroundings. Chekmenev would then photograph the scene, with the subject, the social worker, and the surrounding environment all in the same frame. The result is incredible. In the background, you can see glimpses into the subject's everyday life. From the objects they surround themselves with, to the artwork that is hanging on the wall, you begin to gather an understanding of this individual’s life. You see not only the rooms and living spaces of these individuals but also the reactions of the social workers that interact with them. When you combine this with the fact that the main subjects almost seem to be as isolated as they would be in a studio environment, you have an image with so many wonderful visual components that it is hard to look away. When I first saw these images I immediately thought back to the first time I saw Myoung Ho Lee’s Tree photographs. Lee would erect massive canvases behind solitary trees, which were then photographed in the context of their environment. I was shocked at how powerfully the simple act of partial isolation could transform a photograph so dramatically. Unlike Lee's Tree images, the photographs in Passport are clearly exploitative. Many of these individuals had absolutely no desire to be photographed. Some would even beg not to have their picture taken and would plead for the social workers to leave them be. Others were unable to comprehend the situation presented before them and were confused as to why they were having their picture taken and why government workers were entering their homes. A man who was not capable of leaving his bed had to be physically lifted by two social workers in order to be photographed. Another, passed away the day after he was photographed — before he could receive his new Ukrainian passport. Ultimately, these photographs were invasive, distressing, and unnecessary ­— a point highlighted when Chekmenev reveals that the old Soviet Era passports ended up being valid until the year 2000. It should also be noted that I do not perceive Chekmenev to be villainous for taking these photographs. He states in an afterword that these photographs were very difficult to take, and he seems to understand, at least in retrospect, that the images were largely unnecessary. At the end of the day, Chekmenev was a photographer, working for the government, who was trying to do his job to the best of his abilities. I’ve encountered many texts questioning whether or not certain photographs are exploitative. I have also seen many photographers defend their work, arguing that their photographs are indeed ethical contrary to what critics may say. What I haven’t seen, is a documentary photographer who will so clearly show that their images did cause great distress to those they photographed. At the end of the day, these photographs were published more than two decades after they were taken, and I fully believe that Chekmenev made the right decision in doing so.